How to remove the content inside of your reviews box section but the rating stars? You don't want to show the content of your reviews box section, only the rating list, rating star & “write a review" button to be shown. For some reasons, on the product page, you only show the rating list, rating star & “write a review" button as the below screenshot. 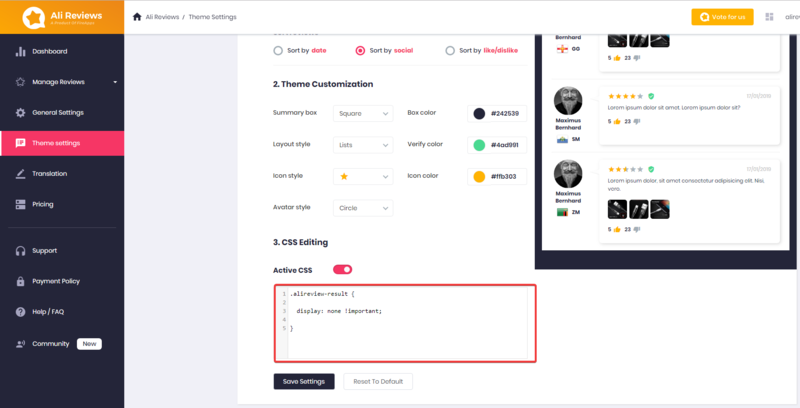 First, please login into our Ali Reviews dashboard ~> Theme Settings ~> Scroll down to the bottom of the page, there will be a CSS Editing section. Copy this code and paste into the box. Finally, save settings and check the result at your storefront.